Violet Press is an independent publisher of nonfiction books. Established in 2006, we publish a growing list of eclectic titles including memoir, poetry, and illustrated reprints. Our books are sold through this website and through bookstores and specialty shops. Violet Press is named for an exceptional black-and-white cat named Violet. 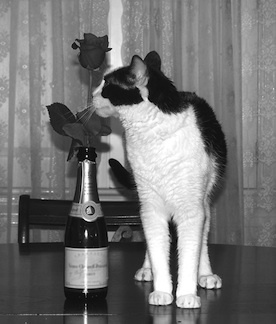 Adopted from a local animal shelter in 1996, she is an intellectual cat with exquisite taste and an appreciation for scholarship and the arts. Highly observant, she patrols the Violet Press offices each day and oversees the production of all of our books. Her high standards inspire the finest production values at the Press. When she is off-duty she enjoys bird watching, playing with string, and sleeping on clean laundry. She takes small frequent meals of salmon accompanied by bottled spring water and the occasional serving of ice cream.